President Donald Trump looks to be preparing for a potentially protracted economic war with China by clearing the decks of disputes with America’s other trading competitors. In just the last few weeks, he’s struck a last-minute deal with Canada and Mexico, signed a trade agreement with South Korea and convinced Japan to begin bilateral economic negotiations. The North American accord also includes provisions seemingly aimed at keeping Chinese products out of the region. That’s good news and bad news for the global economy. On the plus side, it suggests that Trump is not an ultra-isolationist who’s opposed to all types of trade. As economists from JPMorgan Chase & Co. see it, the president is holding back from launching a “war on trade” that could upend the world economy. But he is embarking on a trade war with China that will take a bite out of both countries’ economies next year and raise the risk of a broad pullback in global business confidence, they said in a Sept. 28 research note. U.S. negotiators clearly had China in mind when they hammered out the new trade deal with Mexico and Canada to replace the 1994 North American Free Trade Agreement that Trump labeled a disaster. “A small but important part” of the pact is aimed at China, White House trade adviser Peter Navarro said on National Public Radio on Tuesday. The agreement’s rules of origin, which govern how much value of a car needs to be made in the region, have been touted by the Trump administration as a tool to keep out Chinese inputs and encourage production and investment in the U.S. and North America. The revised agreement also requires the three nations to give three-months’ notice if they start trade negotiations with a “non-market economy,” an indirect reference to China. The U.S. can terminate its pact with Mexico or Canada if either of them strikes a deal with a non-market economy. Canadian Foreign Minister Chrystia Freeland on Monday downplayed the importance of the provision, saying the countries could always terminate the agreement if they wanted to. That is “a possibility which exists no matter what,”’ she told reporters in Ottawa. 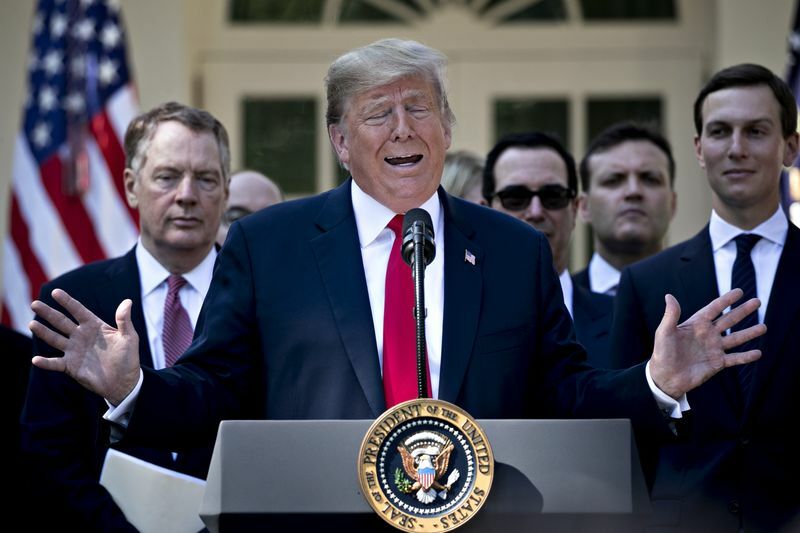 The U.S.-Mexico-Canada Agreement, or USMCA, also prohibits its members from seeking to boost their economic competitiveness by devaluing their currencies, something Trump has accused China of doing in the past. By settling on a deal with America’s neighbors — and beginning talks with allies Japan and the European Union — Trump is strengthening his negotiating position vis-a-vis strategic competitor Beijing. “The next step will be to bear down on China with a broader coalition,” said David Hensley, director of global economics for JPMorgan Chase in New York, noting that other countries share America’s concerns about Beijing’s alleged unfair trade practices and mercantilism. The trade ministers of the U.S., the European Union and Japan issued a joint statement last week squarely aimed at China, pledging to “address non market-oriented policies and practices of third countries” and condemning the theft of intellectual property from multinational corporations. “If the U.S. were to strike new deals with its major trading partners, many of which are also key trading partners of China, Beijing could feel increasingly cornered,” said Eswar Prasad, a former China expert at the International Monetary Fund who now teaches at Cornell University. Terry Haines, head of political analysis for Evercore ISI, said in a note to clients on Monday that his base case is that the U.S. and China won’t strike an agreement until 2019 at the earliest. “But the new Nafta deal does show China and others that the Trump administration is willing to conclude new trade deals as long as they address core U.S. concerns,” he said. That though may be difficult for Beijing to do. That’s because the Trump administration is pressing for major changes in the way China manages its economy via subsidies and government-directed industrial policy. “The things they’re asking for are pretty much unattainable,” said Phil Levy, senior fellow on global economy at the Chicago Council on Global Affairs and a former trade economist in George W. Bush’s Council of Economic Advisers. Trump himself seemed to allude to the difficulties ahead in his comments to reporters on Monday.